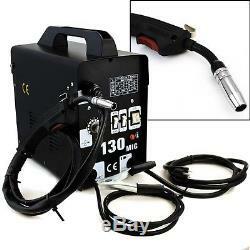 MIG-130 Flux Core Wire Welder Welding Machine w/ Cooling Fan Face Mask 115V. Voltage: 115 V / 60 Hz Single Phase. Weld able wires: 0.023'' to 0.035'' steel and stainless steel, 0.030'' flux-cored. Torch With Full On / Off Safety Control. Ideal for welding mild steel. Factory may change case color without notice. Includes: Mig-130 Main Unit Welding Wire Welding Mask Chipping Hammer/ Wire Brush Torch, Tip Ground Cord. Id-rack are try as much as accurate on color of image. Not 100% guarantee on color as screen may slightly difference. The item "MIG-130 Flux Core Wire Welder Welding Machine with Cooling Fan Face Mask 115V" is in sale since Friday, April 13, 2012. This item is in the category "Business & Industrial\CNC, Metalworking & Manufacturing\Welding & Soldering Equipment\Welding\Welders, Cutters & Torches\MIG Welders". The seller is "id-rack" and is located in Pomona, California.